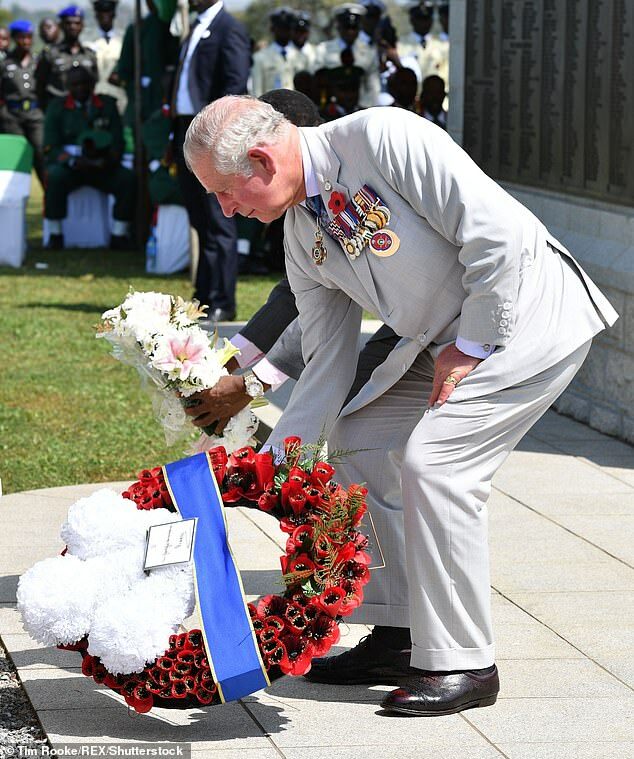 Prince Charles (of Wales), was at the National Military Cemetery in Abuja, yesterday morning, where he laid wreaths in honour of fallen Nigerian heroes, who died in the First and Second World Wars. The wreath-laying ceremony, which was part of activities lined up for his three-day visit to Nigeria, was in memory of the soldiers, sailors and carriers who gave their lives in international wars. He laid the wreaths alongside the Minister of Defence, Mansur Dan-Ali, at a ceremony attended by the Chief of Defence Staff, General Gabriel Olonisakin, Chief of Army Staff Lieutenant General Tukur Buratai, the Chief of Air Staff Air Marshal Sadiq Abubakar and the Chief of Naval Staff, Admiral Ibok-Ette Ibas, some traditional rulers as well as two world wars veterans. Almost 1,000 Nigerian service men deployed in the British Force at the first World War that spanned between 1914 and 1918 lost their lives, while 1,100 died in the Second World War which took place from 1939 to 1945. Prince Charles, however, did not make any remark at the solemn occasion, neither did the Minister of Defence, Mansur Dan-Ali. Soldiers, artillerymen and engineers of the Nigeria Regiment, served in the West African Frontier Force between 1914 and 1918. They took part in the British and French invasion of German Kamerun (now Cameroon) in August 1914 and fought in the German East Africa (now Tanzania) from mid-1916 to February 1918.